Still, cell phones are not just for quick check-ins. Nearly three-quarters (72%) of cell phone owners use their cell phone to have long personal conversations with someone, though these conversations generally happen less frequently than coordinating, checking in or friendly chatting. Just 19% of cell users say they have these types of spoken conversations on their cell phone at least once a day or more often, compared with 53% of those who say they have long exchanges less often. Fewer cell phone owners make voice calls for work: 58% of cell users make voice calls to accomplish work tasks, while a substantial number either never use their cell phone for work purposes (32%) or say the question does not apply to them (9%). Those who use their cell phone for work tend to use it relatively frequently. One third (32%) of cell phone owners make voice calls on their cell phone for work every day or more frequently, while 26% say they make those types of calls less often. Men and women differ in the frequency with which they make different types of calls. Women are slightly more likely to place frequent calls to just say hello and chat and to report on where they are or find out where someone else is. Men are more likely to place frequent calls about coordinating where to meet others, and to make and receive calls about work. Men and women are just as likely to have long conversations to discuss important personal matters on their cell phone, though overall this is a low frequency activity for both men and women. Adults ages 50 and under with cell phones are more likely to use their mobile phone to make voice calls for all purposes. The youngest users are generally the most likely to say that they make calls just to chat, to check in, to monitor or share their location, or to have long personal conversations. Work-related conversations on a cell phone are fairly equally shared by age, until retirement age, when the likelihood of making these types of calls declines substantially. African-Americans and English-speaking Hispanics are also more likely to use the cell phone for all types of conversations more frequently than their white counterparts. The one exception is calls about work, where there are no differences by race or ethnicity. Parents are also substantial users of voice calling for all reasons when compared with non-parents. They are more likely to use their cell phone several times a day for work calls, to coordinate a physical meeting, to check in with someone, to say hello and chat and to have long personal conversations. Cell phone owners with lower education levels and from households with lower incomes are more likely than higher income users and those with greater levels of education to use the phone frequently to just say hello and chat and to have long personal conversations. Cell owners of greater income or education level are more likely to use their phone to talk about work. 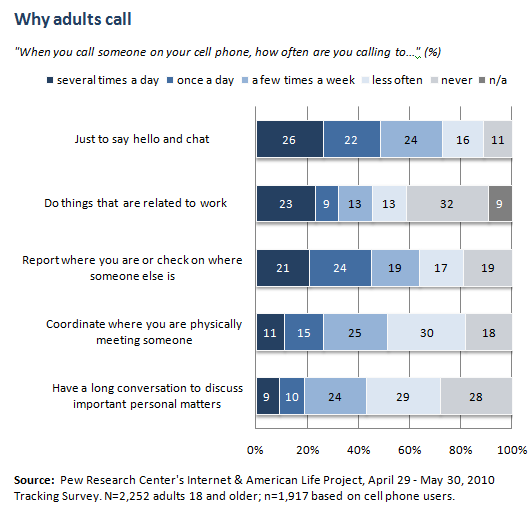 Similar to voice calling, adults most often use text messaging to “just say hello and chat” with others. More than 4 in 5 (84%) text messaging adults send and receive texts just to say hello, and nearly half (49%) send these types of messages every day or more often. Text messaging adults are nearly as likely to use texts to report their location or check on someone else’s location as they are to say hello, with 79% of texters doing so, and nearly 2 in 5 (39%) saying they text to check in daily or more often. Using texts to coordinate where you are meeting someone is another popular use of text messaging by adults, with three quarters (76%) of texters using texts for this purpose. 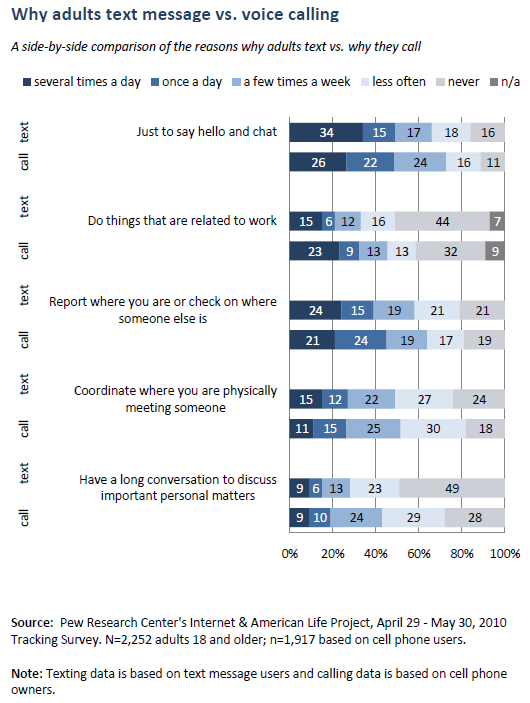 But coordinating a physical meeting with someone is not done as frequently as checking in or saying hello – only a little more than a quarter (27%) of texters coordinate a meeting at least once a day or more often, and another quarter (24%) say they never do so via text message. Sending and receiving text messages has one particular advantage over voice calling – with the proper phone settings engaged, text messages can transfer information silently between two or more people. Two thirds of texters (65%) say they take advantage of the ability to silently create and send text messages. A little less than a quarter (23%) of texters say they do this daily or more often, while another third (34%) say they never send messages under these circumstances. As with voice calling, a comparatively smaller percentage of texters send and receive text messages for work on their cell phone, with just under half (49%) saying they have ever sent a work-related text message. Just about one in five texters say they send work-related texts every day or more frequently, while the bulk of texters (44%) say they never send work-related messages. Texting is less likely to be used for long conversations on personal matters than voice calling. While 80% of text message users make long voice calls to discuss important personal matters, just about half (51%) of texters have long, personal text message exchanges. 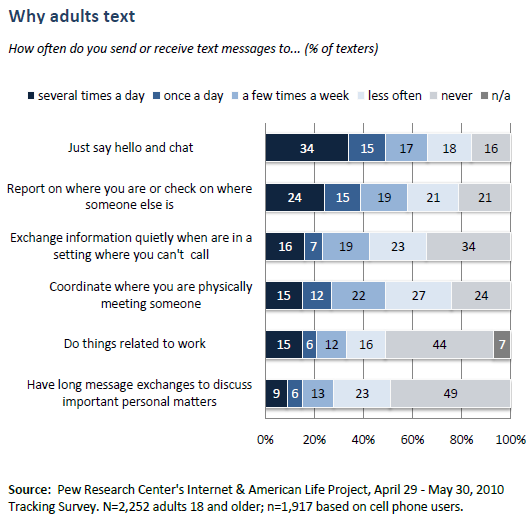 But half of texters (49%) never have long personal exchanges by text, and just 15% of texters have these kinds of exchanges daily or more often. African Americans who send and receive text messages are more likely than their white counterparts to text several times a day for every reason queried in the survey. African Americans are more likely than whites to say they text several times a day just to say hello and chat, to check in on someone or report their own whereabouts, to coordinate meeting someone, to do things related to work, to exchange information quietly and to have long exchanges on important personal matters. In a similar vein young adults who text are more likely than older adults to text frequently for all the reasons probed, with the very youngest adults (18-24) the most likely to report these behaviors, except for texting about work and long exchanges. Lower income and lower education texters are more likely than those with higher incomes or education levels to text for social reasons – to say hello, to check in and to have long personal exchanges on important issues. Where a person lives also relates to the frequency with which they use text messaging for different purposes. Texters who live in urban areas are more likely than suburbanites to say they report on where they are or check in with someone else by text, coordinate physically meeting someone, exchange messages quietly and have long exchanges of texts on important personal issues. Rural dwellers are more likely than suburbanites to use text messaging to say hello and chat. Texting on your cell phone as an internet replacement? Adults with cell phones who text, but who use the internet infrequently, are more likely to use text messaging to have long conversations. Adults who use the internet less than once a week are more likely than those who use the internet more frequently to say they have long message exchanges on important personal topics several times a day – 22% of infrequent internet users report this, while 8% of daily internet users and 6% of those who use the internet several times a week report having frequent, long text exchanges. These infrequent internet users are also more likely than weekly users to use text messaging to coordinate meeting up with someone (21% vs. 8%) and to use text messaging to communicate silently with someone (19% vs. 7%). Taken together, these findings suggest that some cell phone users may be using their phone’s texting capabilities as a substitute for internet access on a computer. Not surprisingly, those who send and receive large numbers of texts each day, are more likely to say that they text frequently for all reasons than those who send and receive fewer messages. In a similar vein, those who make and receive large numbers of voice calls on their cell phone each day are also more likely to send and receive text messages for a variety of reasons. However, a subset of cell phone owners say that on a typical day they do not send and receive voice calls on their phones and the bulk of these users don’t text as much as heavier callers and for most reasons, report that they are less likely to text daily than even light texters. Still, another one in 5 of those who say they don’t call on a typical day do say that they send and receive texts just to say hello and to do things related to work several times a day. This suggests that infrequent voice callers may be divided into two groups – those who use text in place of voice calling to have personal and professional exchanges and those who simply do not communicate with others on the cell phone by any method very often.